What makes Chinese noodles lo mein is how they are cooked, according to Epicurious.com. Lo mein noodles are boiled so they remain soft, not fried like chow mein noodles. The specific ingredients that make up the rest of this dish may vary according to taste. If Chinese noodles can't be found in your supermarket, ramen, spaghetti or linguini may be substituted. Boil 4 cups of lightly salted water in a saucepan. Add noodles and boil until slightly undercooked, about three to four minutes. Drain and set aside. Start another pot of water to boil while you cook the vegetables. 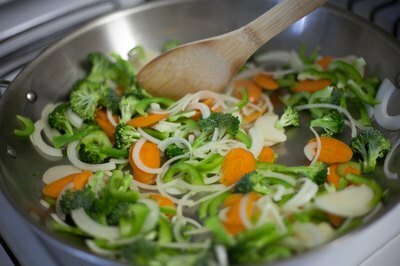 Stir-fry vegetables in a wok or saute until tender, but with some crispiness remaining. 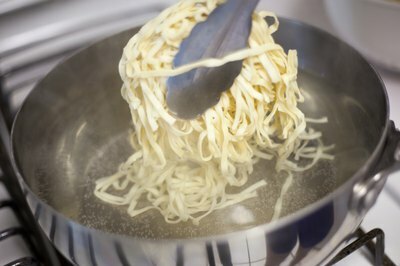 Dip the noodles in the second pot of boiling water for a few seconds to heat and then drain. Toss noodles with the vegetables until well mixed. Add Hoisin sauce until all ingredients are coated and serve immediately. 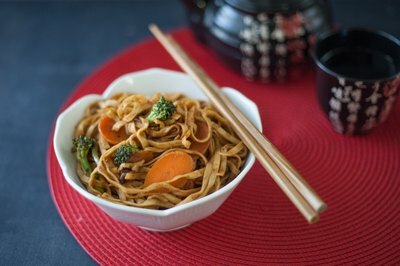 This article adapts and simplifies an expert American Chinese chow mein recipe for the eHow audience.